They make a special axe, small axe. They hit them in the back of the axe, in the head, in the back of the head. Sometimes not; sometimes one strike doesn't kill them, and they sort of take a -- usually take the front of the axe and slice their stomach. And all the victims were liver and spleen taken out by the Khmer Rouge. Some of the liver they eat, and some spleen. They told, I think, the spleen -- they learned -- they said that the spleens were taken for their medicine. I don't know what medicine; this was the saying. But every day you hear the strike of the back of the axe into the people's heads, two or three people's heads. Luckily, sometimes they don't ask the children, don't ask us to watch, because we were tired. I was tired out of the work, and we would work. We were asked to work, you know, at five o'clock in the morning, and no food to each sometime two weeks or so, and some of the kids already got stuck. We walk on the road or go to eat in the rice field, and some of the kids got stuck in the mud and just died there. Some of the kids fall; they died. I remember that I was feeling dizzy, you know, and I tried to keep myself standing up. If I fall down or something, I would, just like other kids, would die. The thing is, also, they killed the young kids, too. 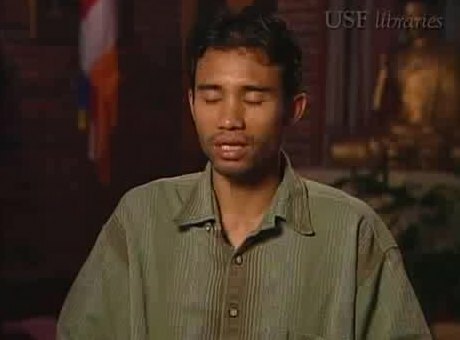 They killed the kids, too, because some of them cannot work anymore, and they just practically sleep, and sick, and if they're sick too long, then the Khmer Rouge said there's no use to have them sleeping there.